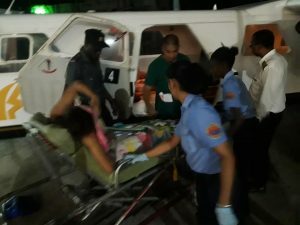 This injured schoolgirl groaned as she was being lifted out of the plane and placed on a stretcher by first responders. Atr extreme right is Captain Learie Barclay who flew the plane from Bartica to Eugene F. Correia ‘Ogle’ International Airport. Three students of Bartica Secondary School were Wednesday afternoon injured after the boat they were returning home in ran aground, officials said. They were air-dashed to the city aboard a Roraima Airways Trislander from the Bartica Airstrip. 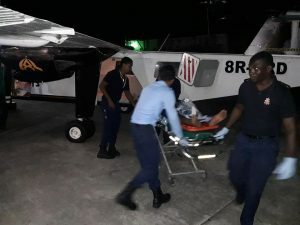 On landing at the Eugene F. Correia ‘Ogle’ International Airport, the plane was greeted by emergency first responders from the Guyana Fire Service and the Georgetown Public Hospital. They carefully removed the injured children and the boat captain and placed them in two ambulances. Preliminary information is that the three children sustained spinal injuries. Those injured include Sheneil Moshett, Cleaveroy Edmonds, Jamal Thornhill and the captain, Akeem Williams. Regional Chairman, Gordon Bradford confirmed that the incident occurred at Goshen, Riverview. One of the injured persons being removed from the Roraima Airways Trislander at the Eugene F. Correia ‘Ogle’ International Airport. Divisional Commander Senior Superintendent Adonis said the boat shuttling school children ran ashore and a number of children were injured. The Police and Maritime Administration officials as well as the Regional Executive Officer of Region Seven travelled to the incident site. “What we want to ascertain is that all of the passengers in the boat are accounted for and that was the case and then we had to scramble to get an aircraft to come in and we got Roraima Airways,” Bradford added. It is unclear how the captain of the boat lost control, but an initial inspection revealed that a cable was cut.